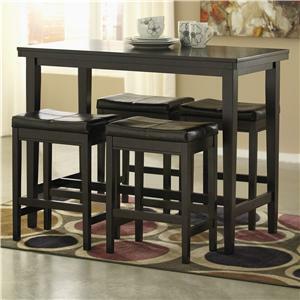 This casual pub table and chair set will be perfect for your dining area. 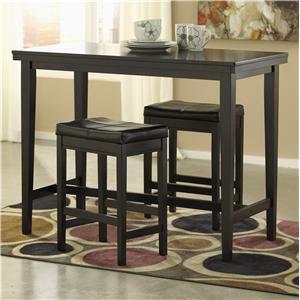 The warm espresso finish is lovely on a simple square top table with square legs and plain edges. 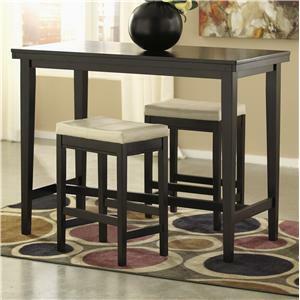 The bar stools have contoured wooden seats for comfort, and high slatted chair backs with a grid pattern. 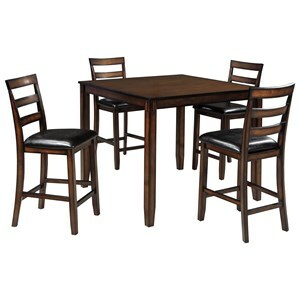 This contemporary set will blend well with your home decor and meet your casual dining needs. 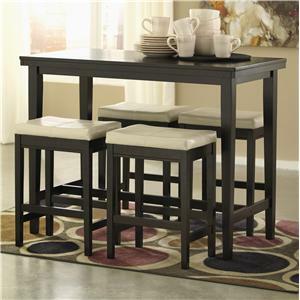 The 2552 Square Leg Pub Table With 4 Bar Stools by Primo International at Corner Furniture in the Bronx, Yonkers, Mount Vernon, White Plains, Manhattan, NYC, New York area. Product availability may vary. Contact us for the most current availability on this product. Case Detail Square legs and straight edges. Description: Top Wood top with smooth edges. The 2552 collection is cool and contemporary. The casual dining set will become a favorite with family members and guests. A warm espresso finish is lovely on the simple wooden pieces. This dining collection will give your room character and class. The 2552 collection is a great option if you are looking for Contemporary furniture in the Bronx, Yonkers, Mount Vernon, White Plains, Manhattan, NYC, New York area.